New England has some iconic lighthouses that dot its coastline. 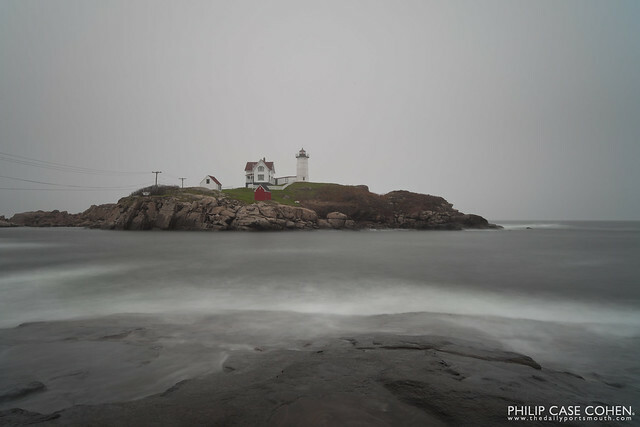 We’re lucky here in New Hampshire to be close to many of them, including Nubble Lighthouse pictured here. One of my favorite things to do when I have guests in town is to bring them up to Nubble Light to see the power of the ocean and watch the waves beat up on the island lighthouse and get a good taste of the New England experience. This particular afternoon was pretty dreary, but it didn’t stop us from making the trek and standing out to watch for a good long while. This picture makes me think of cold rain hitting my face while I stare at the lighthouse out in the distance, cup of hot chocolate in hand to help keep me warm. I continue to visit your site Phil because of the images, thoughts and feelings your art evokes.